Hollybeary Creations : April Release Sneaks from YNS!! April Release Sneaks from YNS!! Happy Saturday.. Who's ready for a new release from Your Next Stamp? Today is preview Day and the design team is sharing lots of inspiration with the release. I sharing a peek at the new set Sweet Hummingbird and the Reversed Scallop Peek a Boo Die set. I created a Kraft colored card base and then I added a piece of patter paper that was die cut with the Stitched Rectangle Dies. Then I stamped the images onto a piece of watercolor paper and die cut that panel as well. I added a piece of twine around it and adhered it to the card front with some foam tape. I'm using the Spotlighting technique.. 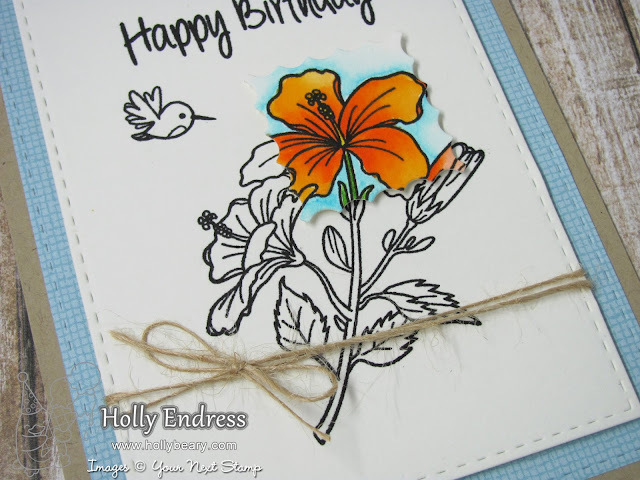 I stamped the flower image a second time onto some watercolor paper and then I colored a portion of it with my Zig Clean Color Real Brush Markers and then I die cut that portion out using the Reverse Scallop Peek a Boo Dies. Then I adhered it over the original image with some foam tape lining it up. You can do this with any shape for your colored image. 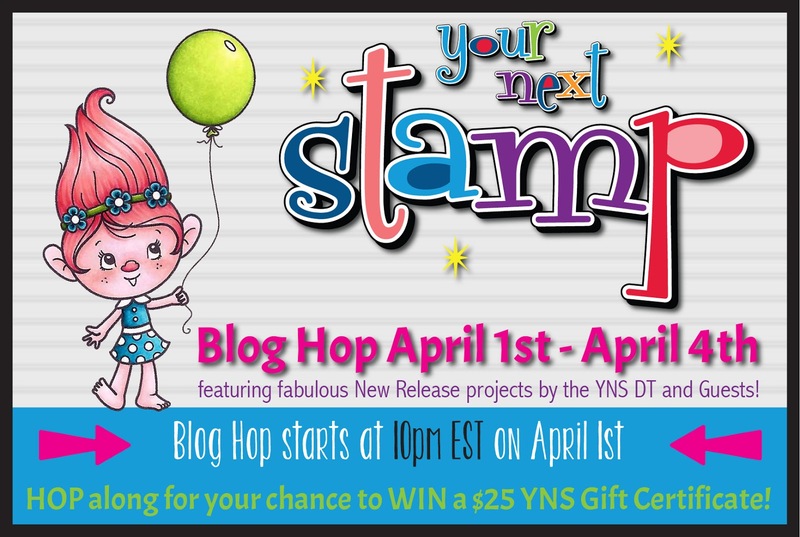 10pm EST for our New Release Blog Hop. You can see more sneaks in the video below.. and be sure to stay until the end to find out how you can Win one of our April Release sets! Oh so gorgeous Holly. Love how you used the reverse scallop peeka boo dies. Gorgeous! That pop of orange is so fresh and wonderful! I love this technique! So very different and so pretty. Love how you lift up and pop the orange flower, so pretty! I love the spotlighting on the flower. Thanks for the video also!! Great video and cards, Holly!! Oh my gosh, your cards are sooooo cute. Live the chameleon o es especially with the new background die cut. 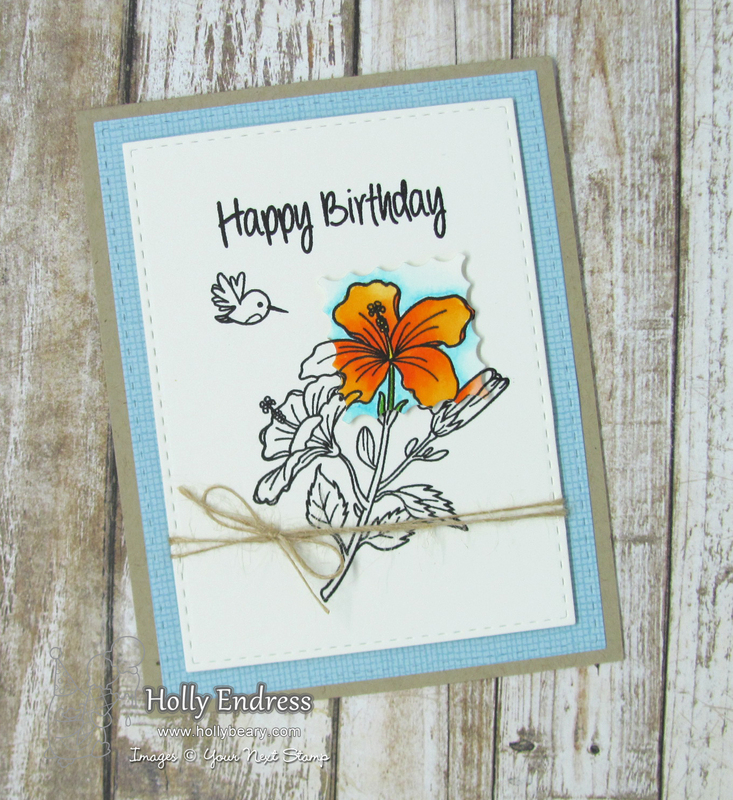 Beautiful spot light card Holly! Thanks for the great video! So many cute cards! watched your video ,your cards are stunning!!! love them!!! Great card and gotta learn the Spotlighting technique too!